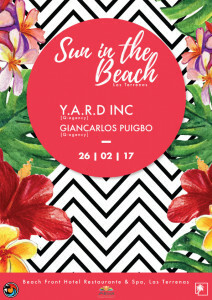 The 26th of February 2017, Terrenas Paradise & Las Terrenas Click are pleased to invite you to the first edition of SUN ON THE BEACH. The event will be taking place belong the beach shore of the exclusive Beach Front Alisei Hotel Restaurant & Spa, the perfect location for a Groovy Terrenas style Sunday. Long weekend vibes, sandy feet and those groovy tunes.